Astronaut Randy Bresnik works outside the space station’s Columbus laboratory module during a spacewalk in November 2009. Bresnik last visited the station aboard space shuttle Atlantis during the STS-129 mission. International Space Station managers and spacewalk experts will talk next week about a series of three spacewalks taking place in October. NASA TV will broadcast a briefing Monday at 2 p.m. EDT to describe the spacewalk activities planned for Oct.5, 10 and 18. Commander Randy Bresnik will lead all three spacewalks partnering with NASA astronauts Mark Vande Hei on the first two and Joe Acaba on the third. The three NASA astronauts are heading into the weekend checking their resizable U.S. spacesuits to ensure a good fit next week. Bresnik last conducted a pair of spacewalks in November 2009 when he visited the station as a mission specialist for STS-129. 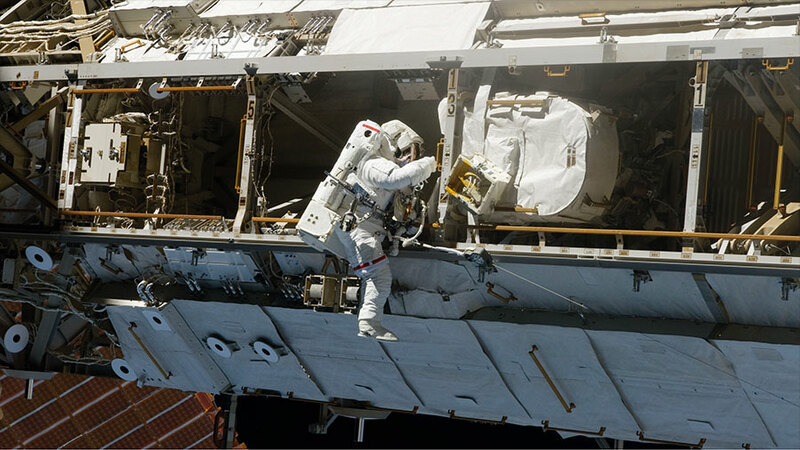 Acaba also conducted two previous spacewalks that took place in March 2009 during STS-119. Vande Hei will be participating in his first two spacewalks. The spacewalkers will first replace a latching end effector (LEE) on the tip of the Canadarm2 robotic arm. Next, the replacement LEE will be lubricated and a pair of external station cameras will be replaced. Astronauts Mark Vande Hei (left) and Paolo Nespoli work on science gear inside the Destiny laboratory module. The International Space Station boosted its orbit Wednesday to prepare for the arrival of a pair of Russian spaceships before the end of the year. Meanwhile, the Expedition 53 crew continued getting ready for next week’s spacewalk and explored how living in space affects their bodies. The docked Progress 67 resupply ship fired its engines Wednesday for three minutes and 40 seconds lifting the space station to a higher orbit. The reboost is the first of three with the next two taking place in November. 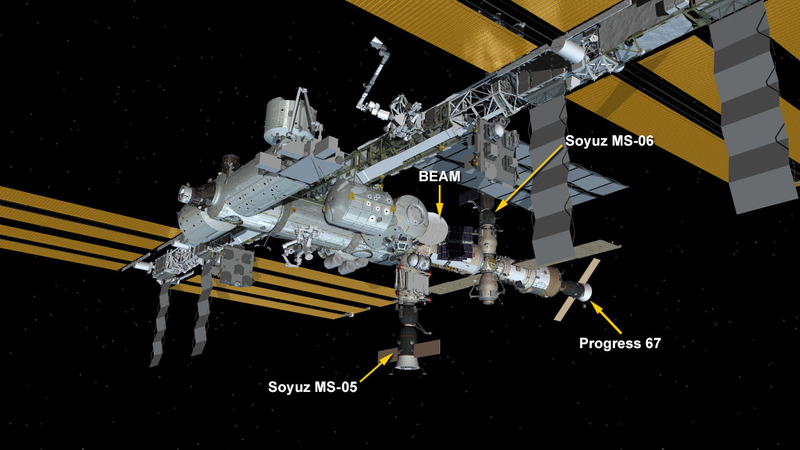 The reboosts will place the station at the correct altitude to receive a Progress 68 resupply ship in mid-October and the Soyuz MS-07 crew ship in mid-December. Spacewalkers Randy Bresnik and Mark Vande Hei are getting their U.S. spacesuits ready ahead of an Oct. 5 spacewalk. They inspected their suits today, scrubbed the cooling loops and filled them with water. The duo will work outside for about 6.5 hours next Thursday and replace a latching end effector at the tip of the Canadarm2. NASA astronaut Joe Acaba attached sensors to himself and worked out on the station’s exercise bike today to help scientists understand how microgravity affects physical exertion. The VO2max study is researching how astronauts expend energy in space and how it may impact emergency situations and spacewalks. The six Expedition 53 crew members gather together in the Destiny laboratory module for a group portrait. 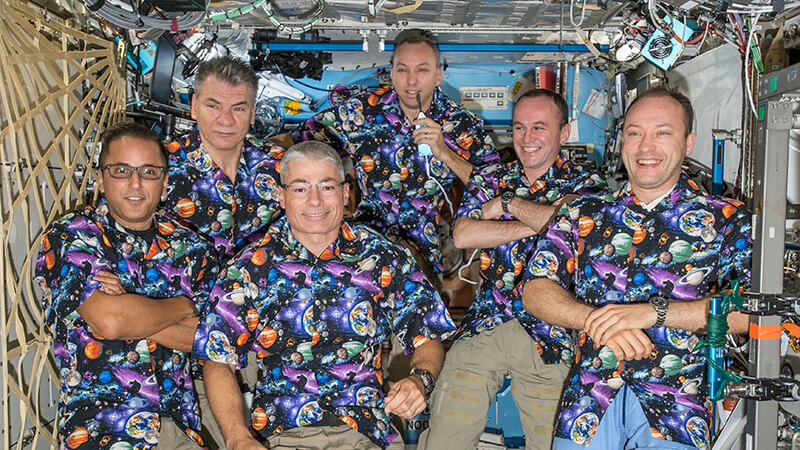 From left are astronauts Joe Acaba, Paolo Nespoli and Mark Vande Hei, Commander Randy Bresnik and cosmonauts Sergey Ryazanskiy and Alexander Misurkin. 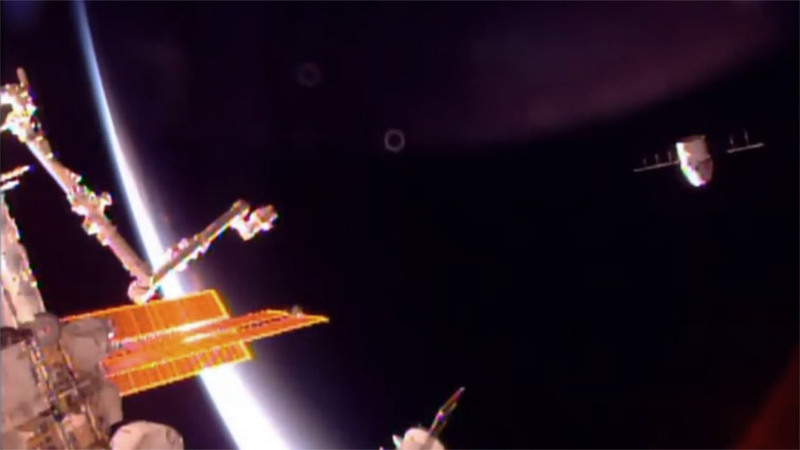 Sensors are being installed today in the International Space Station to detect neutron radiation. The crew is also setting up a botany study, conducting human research and getting ready for next week’s spacewalk. Cosmonaut Sergey Ryazanskiy handed over a set of radiation sensors to NASA astronaut Joe Acaba today. Acaba then installed the sensors in the station’s U.S. segment to measure only the neutron radiation levels the orbital lab is exposed to. The data from the Radi-N2 study will help scientists understand the exposure risk to crew members and develop advanced protective measures. Acaba also continued installing hardware for the Veggie-3 experiment to get the station ready for a new crop of lettuce and cabbage. 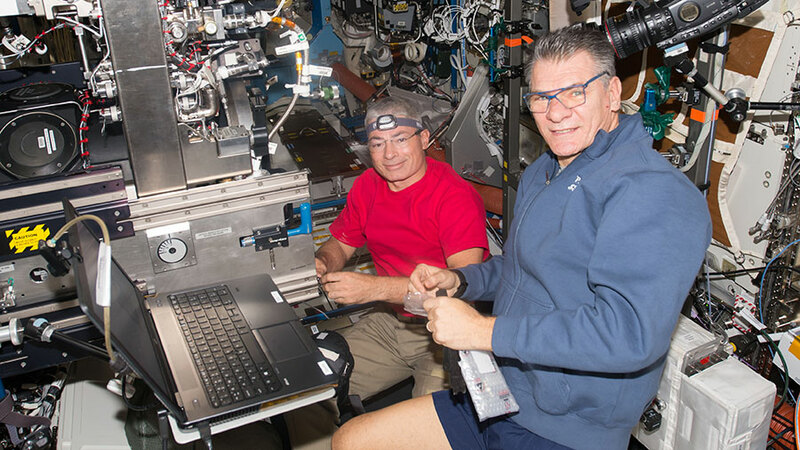 Flight Engineer Mark Vande Hei strapped himself into the station’s exercise bike for the VO2max experiment that observes physical exertion during a space mission. A pair of spacewalkers took a look at the procedures they will use Oct. 5 to replace a latching end effector at the tip of the Canadarm2. Vande Hei will join Commander Randy Bresnik for that spacewalk and a second planned for Oct. 10. 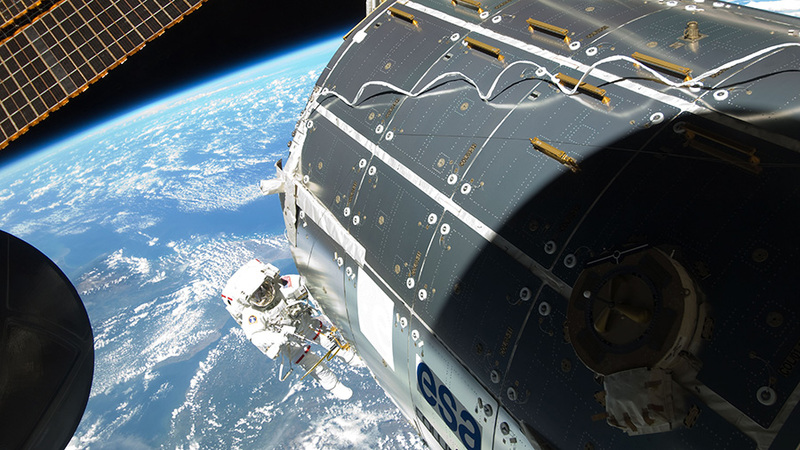 Acaba will join Bresnik for a third spacewalk set for Oct. 18. 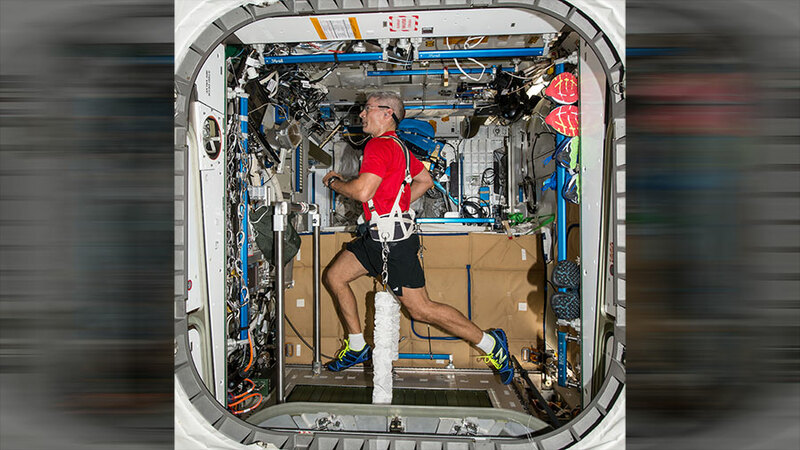 NASA astronaut Mark Vande Hei jogs on a treadmill inside the space station. The International Space Station is once again providing a platform to test the growth of cabbage and lettuce for future human consumption in space. Aside from today’s botany set up, the Expedition 53 crew also explored how living in space affects the human physiology. NASA astronaut Joe Acaba began setting up hardware for the Veggie-3 experiment Tuesday morning to grow a variety of lettuce and cabbage. Scientists are studying how plants grow in space to learn how to sustain future crews as NASA plans longer missions farther out in space. Acaba also joined European Space Agency astronaut Paolo Nespoli collecting blood and urine samples for a pair of biomedical experiments. The long-running Biochemical Profile and Repository studies are documenting the various changes the human body experiences during a long-term space mission. Commander Randy Bresnik continued gathering spacewalk equipment with Flight Engineer Mark Vande Hei ahead of an Oct. 5 spacewalk. The pair also checked out their emergency jet packs and sized their spacesuits. This will be the first of three spacewalks in October to replace a latching end effector on the tip of the Canadarm2 and replace a pair of external cameras. NASA astronaut Joe Acaba is seen during a spacewalk in March 2009. He was working on the Starboard-1 truss structure while space shuttle Discovery was docked to the station during STS-119. The Expedition 53 crew is getting ready for a trio of spacewalks next month while helping scientists understand what living in space does to the human body. NASA astronauts Randy Bresnik and Mark Vande Hei trained for a spacewalk emergency today wearing virtual reality gear. The spacewalkers practiced maneuvering specialized jet packs attached to their spacesuits in the unlikely event they become untethered from the station. The duo will go on a pair of spacewalks on Oct. 5 and 10. 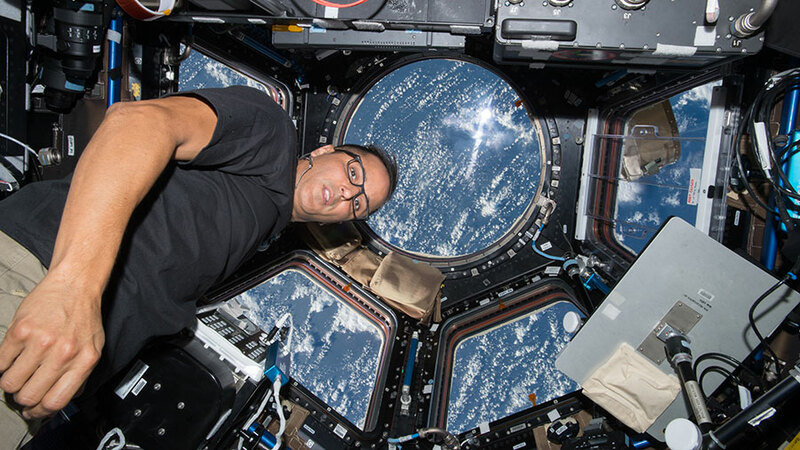 NASA astronaut Joe Acaba will join Bresnik Oct. 18 for the third and final spacewalk. The three spacewalkers will replace and lubricate one of two end effectors on the tip of the Canadarm2 robotic arm. They will also replace a pair of cameras located on the station’s truss structure. More muscle and bone research continued today as cosmonaut Sergey Ryazanskiy joined Italian astronaut Paolo Nespoli for the Sarcolab-3 study. The research observes leg muscle and tendon changes caused by microgravity using an ultrasound scan and other sensors during an exercise session. Bresnik collected his breath sample to help document any bone marrow and blood cell changes his body may be experiencing in space. 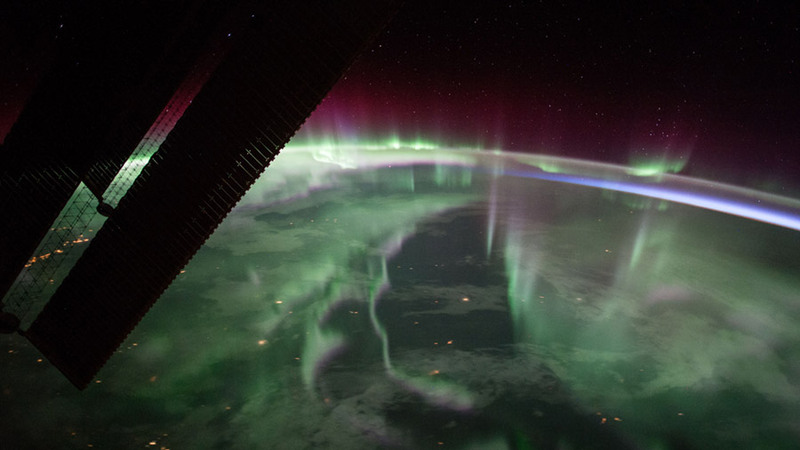 The spectacular aurora borealis, or the “northern lights,” over Canada is sighted from the space station near the highest point of its orbital path. The station’s main solar arrays are seen in the left foreground. The Expedition 53 crew worked on a variety of astronomy gear today that looks at meteors in Earth orbit and harmful radiation from deep space. The crew also explored how microgravity affects human bones and muscles. Flight Engineer Mark Vande Hei worked on a camera for the Meteor experiment, ongoing since March 2016, which peers out of a specialized window in the Destiny laboratory module. The camera observes meteors and meteor showers and analyzes the imagery to determine their physical and chemical composition. Flight Engineer Joe Acaba installed the Fast Neutron Spectrometer in the Unity module today to explore a new technique that measures deep space radiation. The new technology may be used to provide a more accurate assessment of the mixed radiation future crews and spacecraft may be exposed to. Cosmonaut Sergey Ryazanskiy strapped himself into the Muscle Atrophy Research and Exercise System (MARES) chair today for a look at his calf muscle and tendons. Flight Engineer Paolo Nespoli assisted Ryazanskiy into the MARES chair and Commander Randy Bresnik collected ultrasound imagery of his leg. The data is being collected for the Sarcolab-3 experiment that is observing space-induced chemical and structural changes in muscle fibers. 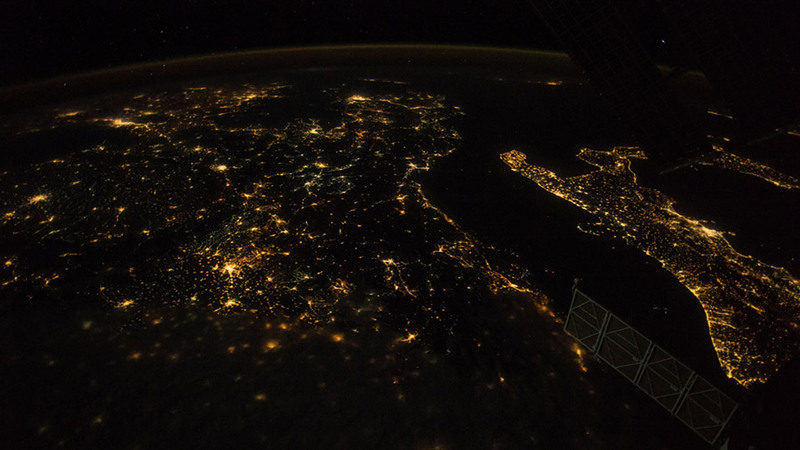 This night time view of southern Europe prominently features the “boot” of Italy, the home of current Expedition 53 crew member Paolo Nespoli of the European Space Agency. Expedition 53 is gearing up for three maintenance spacewalks set to take place in October over a period of two weeks. Meanwhile, the six-member crew continued researching today how their long-term missions in space affect their bodies. Commander Randy Bresnik began unpacking spacewalking gear today ahead of the first of three spacewalks set to begin Oct. 5. He will lead all three spacewalks with NASA astronauts Mark Vande Hei and Joe Acaba. Vande Hei will join him on the first two and Acaba will participate in the final spacewalk. The trio will replace one of the two end effectors on the Canadarm2 robotic arm, lubricate the new component and replace cameras at two locations on the station’s truss. Flight Engineers Paolo Nespoli and Sergey Ryazanskiy are exploring how living in space impacts their bone marrow. The study takes a look at blood and breath samples with the blood being processed in a centrifuge. Bresnik is also collecting his blood and urine samples that scientists will later analyze for any physiological changes caused by microgravity. The departure of the SpaceX Dragon Sunday morning leaves three spaceships parked at the space station including the Progress 67 resupply ship and the Soyuz MS-05 and MS-06 crew ships. SpaceX’s Dragon cargo craft splashed down in the Pacific Ocean at approximately 10:14 a.m. EDT, southwest of Long Beach, California, and the recovery process is underway, marking the end of the company’s twelfth contracted cargo resupply mission to the International Space Station for NASA. Expedition 53 Flight Engineer Paolo Nespoli of ESA (European Space Agency) and International Space Station Commander Randy Bresnik of NASA released the Dragon spacecraft earlier this morning at 4:40 a.m.
A variety of technological and biological studies are returning in Dragon. NASA and the Center for the Advancement of Science in Space (CASIS), the non-profit organization that manages research aboard the U.S. national laboratory portion of the space station, will receive time-sensitive samples and begin working with researchers to process and distribute them within 48 hours. The Lung Tissue experiment used the microgravity environment of space to test strategies for growing new lung tissue. The ultimate goal of this investigation is to produce bioengineered human lung tissue that can be used as a predictive model of human responses allowing for the study of lung development, lung physiology or disease pathology. Samples from the CASIS PCG 7 study used the orbiting laboratory’s microgravity environment to grow larger versions of an important protein implicated in Parkinson’s disease. Developed by the Michael J. Fox Foundation, Anatrace and Com-Pac International, researchers will look to take advantage of the station’s microgravity environment which allows protein crystals to grow larger and in more perfect shapes than earth-grown crystals, allowing them to be better analyzed on Earth. Defining the exact shape and morphology of LRRK2 would help scientists to better understand the pathology of Parkinson’s and aid in the development of therapies against this target. Mice from NASA’s Rodent Research-9 study also will return live to Earth for additional study. The investigation combined three studies into one mission, with two looking at how microgravity affects blood vessels in the brain and in the eyes and the third looking at cartilage loss in hip and knee joints. For humans on Earth, research related to limited mobility and degrading joints can help scientists understand how arthritis develops, and a better understanding of the visual impairments experienced by astronauts can help identify causes and treatments for eye disorders. Dragon launched to the space station Aug. 14 from Launch Complex 39A at NASA’s Kennedy Space Center in Florida and arrived at the station Aug. 16, delivering more than 6,400 pounds of supplies and cargo. At 4:40 a.m. EDT, Expedition 53 Flight Engineer Paolo Nespoli of ESA (European Space Agency) and International Space Station Commander Randy Bresnik used the Canadarm2 robotic arm to release the SpaceX Dragon after it was detached from the Earth-facing port of the Harmony module. Dragon’s thrusters will be fired to move the spacecraft a safe distance from the station before SpaceX flight controllers in Hawthorne, California, command its deorbit burn. The capsule will splash down at about 10:14 a.m. in the Pacific Ocean, where recovery forces will retrieve the capsule and its more than 3,800 pounds of cargo and research. A variety of technological and biological studies are returning in Dragon. Splashdown will not be broadcast on NASA TV. Dragon, the only space station resupply spacecraft able to return to Earth intact, launched to the space station Aug. 14 from Launch Complex 39A at NASA’s Kennedy Space Center in Florida, and arrived at the station Aug. 16 carrying more than 6,400 pounds of supplies and cargo on SpaceX’s twelfth commercial resupply mission to the station for NASA.